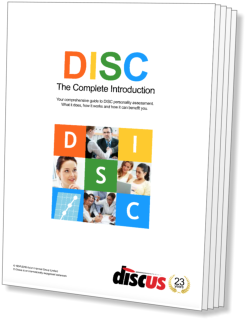 The concept behind the Style Card is simple - the direct use of DISC's underlying theory as a method of profiling in its own right. By directly assessing where a candidate lies on each of the two behavioural 'axes', it is possible to plot their individual style as a point on a graph. There are a number of different ways of doing this, but the most common is to use a square divided into smaller squares, as shown in the diagram below. This grid of squares directly represents a candidate's style in terms of the 'Biaxial Model' - we can place a marker within the grid to indicate the type of the individual concerned. Very Open characters, for example, would have a marker to the right of the grid, while markers for more Receptive types would appear somewhere near the bottom. 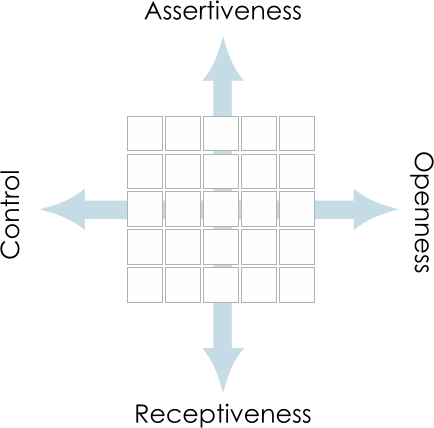 The corners of the grid represent combinations of traits - a marker in the top-left corner would relate to a style that incorporated elements of both Assertiveness and Control. Compare this with the second diagram shown under The Biaxial Model of DISC, and you will see that the top-left hand corner corresponds to the DISC factor of Dominance. This is no coincidence - the Style Card approach is effectively just a simpler method of describing DISC profiles.